The current church is from the 10th or 11th century, but the ambo is from the 5th, recycled from an earlier building. 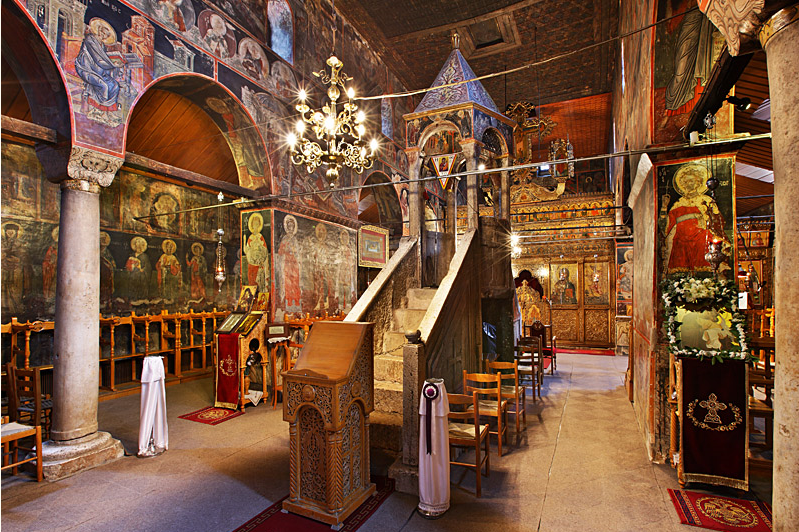 Ambos of this type were once upon a time standard for Byzantine churches, the place from which the litanies and Scriptural readings were sung. Hagia Sophia had a huge one, which was connected to the main sanctuary by a path formed by two marble balustrades. Certain features of the Byzantine liturgy are still traditionally done in the middle of the nave, in memory of this fact, the most notable being the final prayer, which is still called the ambo prayer. 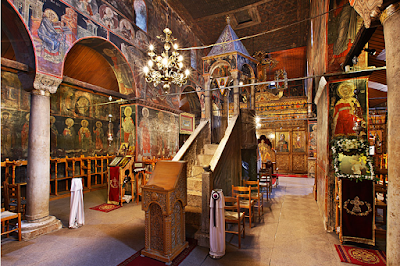 The church also preserves fresco work of the 12th century, but most of the painting is from the 1570s, and carved wooden iconostasis is from the 17th century. The second image also shows the place where the Scriptures were read in a church, this one in the West. Public domain image from the Metropolitan Museum of Art, NYC. Click here to see a high-resolution version which can be viewed in very tight close-up. This is the work of an anonymous painter from the Netherlands, dated about 1525, and now in the Metropolitan Museum of Art in New York City. It is known as “A Sermon on Charity”, from fact that a young and richly dressed man is shown in the church on the left, while in the background on the right, he has a money box and is giving alms to the poor. However, it also described as “The Conversion of St Anthony the Abbot”, who undertook to live the anachoretic life after hearing the words “If thou would be perfect, go and sell all thou hast, and give it to the poor” as the Gospel in church one day. 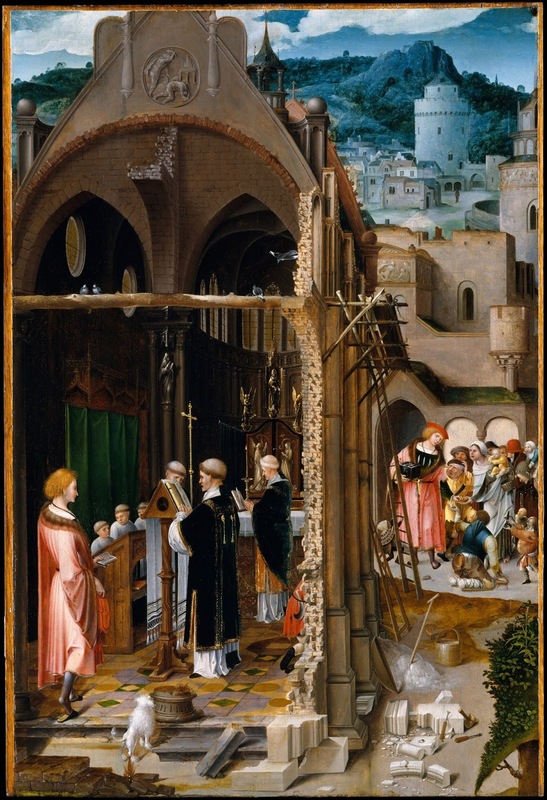 The scene in the church is most definitely not the preaching of sermon, but the singing of the Gospel from a movable pulpit during Mass; this seems to make the explanation of it as a scene from the life of St Anthony more likely. The clergy are wearing black, but the Mass is not necessarily a Requiem; black vestments were used far more extensively in the Middle Ages than in the Tridentine period, and particularly in penitential seasons. The wings of the altarpiece are closed, showing a plain white image of the Annunciation; it was a common custom to close the altarpieces in Lent, so they could be opened again at Easter. The Annunciation was often painted in this very sober way on the back of the wings, to maintain the austere character of the season, while acknowledging an important feast that usually occurs in Lent. The subdeacon is holding the cross behind the pulpit; a similar custom is still observed in the Dominican Mass to this day on solemn feasts, but the cross is held by a server, and the subdeacon stands behind the deacon. The Gospel at a solemn Mass in the Dominican Rite at the FSSP church in Rome, Santissima Trinità dei Pellegrini, on the feast of St Thomas Aquinas last year. The subdeacon stands behind the deacon.